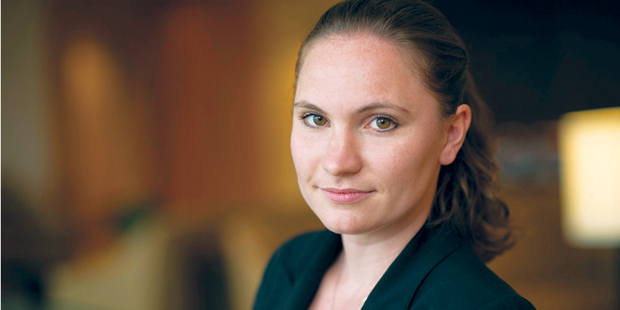 Public interest lawyers are generally a devoted group, but Lauren Burke ’09 displays a dedication far beyond the norm. After Hurricane Sandy hit, she convinced her roommates to share their Brooklyn apartment with an immigrant family of five whose home had been flooded. This act of generosity does not seem extreme to Burke, however. “Randy Hertz’s Juvenile Defender Clinic taught me not to be afraid of doing things that people think are crazy, if your client needs it,” Burke says. Following this mantra has served the indefatigable lawyer—she holds not one, but three public interest jobs—very well. Recently named to Forbes’ “30 under 30: Law & Policy” list, Burke has won every case either in court or on appeal—with one pending. But even more impressive is her track record of creating innovative, holistic legal service programs in every organization where she has worked. The founder and executive director of Atlas: Developing Immigrant Youth (Atlas DIY), a cooperative empowerment center for young immigrants and their allies, Burke also serves as the in-house attorney for the New York Asian Women’s Center (NYAWC), where she built the pro bono legal services program from the ground up. She also teaches Brooklyn Law School’s Immigration Youth Law Clinic, which she developed herself. Burke’s fluency in Mandarin and her experience working with trafficking victims at the Door made her a perfect fit to develop the pro bono program at NYAWC, which now represents more than 100 clients, primarily women, who are survivors of domestic violence, sexual assault, and human trafficking. “I’ve learned so much from Lauren about how to interact with clients and develop client relationships, which is hugely important because the legal work we do involves discussing very traumatic experiences and very personal things,” says Colleen Duffy ’11, an NYAWC attorney who reports to Burke. These days, Burke’s remarkable energy is largely focused on Atlas DIY, the center for immigrant youth that she founded in January 2012. (The children in the family stranded by Sandy were Atlas DIY participants.) Both she and the center have been particularly active since the Obama administration implemented Deferred Action for Childhood Arrivals (DACA), which allows undocumented individuals who arrived in the US before age 16 to defer prosecutorial removal action. By the end of 2012, Atlas DIY had won two DACA cases and filed close to 60 more.